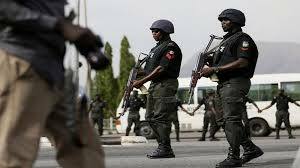 A policeman has shot dead a girl in the Adamo area of Ikorodu, Lagos, during a raid. The killing of the trader sparked off heavy protest as youths in the area gave the patrol team a hot chase, forcing the police to abandon their vehicle and fleeing the scene. The youths seized the patrol vehicle and set it ablaze. A witness, Ben Ndakat, told our correspondent that policemen had stormed the Adamo area on an evening raid of suspected criminal hideouts. The command’s Public Relations Officer (PPRO), DSP Bala Elkana, confirmed that a girl was shot dead: “Yes, a young girl was shot dead by a policeman from the State Criminal Investigation and Intelligence, Panti. I don’t want to preempt their motive to the area, but I believe they were there on surveillance. The policeman who fired the shot is in our custody. We are investigating the matter,” he said.